Love and Society discusses the meaning and importance of love for contemporary society. Love is not only an emotion that occurs in our intimate relationships; it is a special emotion that allows us to relate to each other in a lasting fashion, to create out of our individual pasts a shared past, which enables us to project a shared future. Bringing together the idea of Simmel’s second order forms with theories of love, this insightful volume shows that the answer to why love is so central to society can be found in the social transformation of the last two centuries. It also explains how we can build our strongest social bonds on the fragility of an emotions thanks to the creation of "special moments" (love rituals) and "intimate stories" (love myths) that are central to the weaving of lasting social bonds. Going to the cinema, reading a book together or sharing songs are forms of weaving bonds of love and part of the cycle of love. But love is not only shared between two people; the desire and the search for love is something we share with almost all members of society. With rich empirical data, an analysis of love’s transformation in modernity, and a critical engagement with classical and contemporary theorists, this book provides a lively discussion on the meaning and importance of love for today’s society. It will be of interest to undergraduate and postgraduate students and postdoctoral researchers who are interested in fields such as Sociology of Emotions, Sociological Theory and Sociology of Morality. In often moving ways, this scholarly text explains how love has come to be at the heart of late modern morality. The book beautifully navigates from explaining the sacred to the mundane ideas, myths, rituals and experiences of love and how they have changed. This is a theoretically rich and empirically exciting journey that seeks to illustrate love as a social bond as well as an emotion that has become predominant in linking individuals to the social sphere in durable ways. It is a compelling account of the ways in which love has become the fundamental organising principle of our social world with implications for how intimates are morally distinguished from non-intimates and how consumption is entangled with our selves and desires. Seebach has produced a grand systematic treatise on the historical transformations of love as code, ritual, and experience. Skillfully integrating Simmel and Luhmann with micro-sociology of emotions, he shows how love survives within the frames of contemporary myths and "rituals of the second order" even in the flux of late modernity. Randall Collins, author of Interaction Ritual Chains. 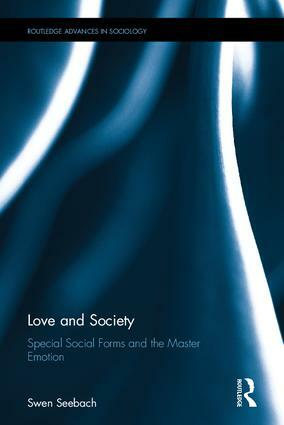 Seebach's Love and Society covers a lot of ground: not only does it superbly review the now crowded space of theories of love, but it also analyzes the rituals, stories and forms of exchange at work at love, and asks what makes love a second order social form, that is a social form made to last. The idea of love as a second order social form is original and persuasively argued throughout. This is an important addition to the philosophical and sociological literature on love. Swen Seebach is a Juan de la Cierva postdoctoral researcher at UAB (Barcelona Autonomous University), Spain. The sociology of emotions has demonstrated the fundamental and pervasive relevance of emotions to all aspects of social life. It is not merely another specialized sub-discipline; rather it aims to reconfigure bases of mainstream sociology. This book series will not only be of interest for specialists in emotions but to sociology at large. It will be a locus for developing enhanced understandings of core problems of sociology, such as power and politics, social interactions and everyday life, macro-micro binaries, social institutions, gender regimes, global social transformations, the state, inequality and social exclusion, identities, bodies and much more.